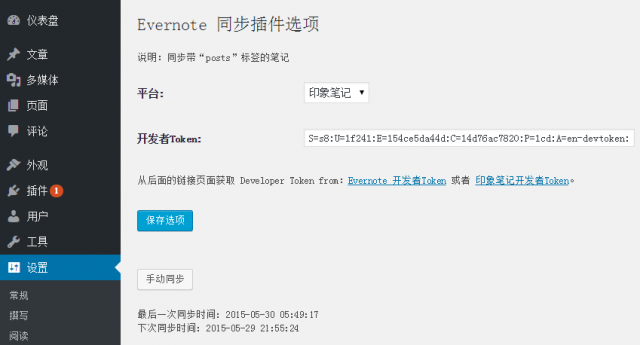 When importing notes from Evernote in WordPress, the note date-time is changed to the date of publication (today). How can I see the actual date from Evernote in WordPress? Thank you for your advice. If nothing else, I will achieve this at next version. Since upgrading to evernote business I can’t sync any business notebooks. I tried changing SEARCH_SCOPE_DEFAULT to 7 or 4 and it crashes during sync. Personal notebooks look to be ok.
Actually, it seems some posts are missed during sync from personal notebooks too – ie 2 out of 30 did not come through. Default only sync 10 recently notes in this plugin. You can modify it at the last version of this plugin. The business account belongs to a customer so I can’t share it, but https://dev.evernote.com/doc/articles/business.php says you can create business accounts for free in sandbox if that helps? Hi there – since I upgraded to evernote business, I am not able to sync any business notebooks. Is there a fix for this coming? Hi, is it possible to sync Evernote child tags with WP child categories? Maybe ask author add “cate:parent_cate_name.child_cate_name” functions. How could I setup category from EverNote (When I write a note)? Add a tag with the same name as the category.